An Epic ambulatory implementation, especially one that covers multiple sites and incorporates both clinical and financial applications, can significantly disrupt an organization’s revenue. 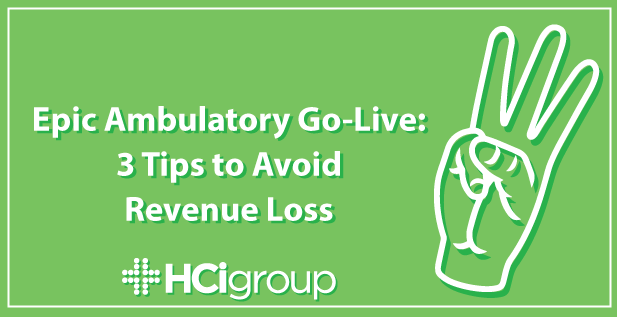 In this blog, HCI Revenue Cycle expert Chelsea Wyatt discusses ways in which an organization can guard against revenue disruption during an ambulatory implementation. A plethora of medical treatments, charting errors, discrepancies in billing protocols, and inadequate knowledge of coding procedures can compromise an organization's ability to properly capture charges and bill for services provided. Revenue disruption can be costly. Your clinical staff, as opposed to billing staff using paper records, is now entering more than 80 percent of all charges. Almost every area of the hospital has a different method of charging in most EHRs. While most EHRs implemented today are enterprise systems, each system still has different applications for outpatient sites, inpatient hospitals, emergency departments, perioperative areas, etc. In outpatient areas alone, charges can be entered and triggered differently, depending on the type of charge. For example, immunization charges may drop differently than procedures, which may drop differently than the visit charge itself. Sometimes this is necessary, as the workflows for these areas vary and the ideal moment for triggering charges differs accordingly. For example, in a regular outpatient office visit, the nurse will finish a visit with a patient, but a physician will often need to write his/her note and potentially add charges before completing the record for that visit. So, charges should not be dropped until the visit is signed. In outpatient therapy areas, the therapists may want multiple charges to fire immediately based on total time spent with the patient. Negative revenue impact may be more extreme in ambulatory areas because outlying clinics may get less attention and support than the central hospital location during go-live. Clinic sites are often trained as a large group for Big Bang implementations. Because vendor training may cover many clinics at once, it is usually broad. As such, training may lack the specificity needed to address the intricacies that would allow each area or specialty to charge properly. Furthermore, training staff on entering charges and how to manage charging issues is just now being recognized as a significant need in the industry, as revenue issues have become more prevalent in recent implementations. Charging issues can also stem from Epic build team problems. Charges may be forgotten when building favorites or preferences, leaving clinicians to search for them instead. This can sometimes lead to the wrong charge being selected because clinicians may have to choose from a search menu or database lookup with many possible choices. Several of these choices may not even be applicable to them, or may have an incorrect revenue code for that area of the hospital. On technique that has seen great success is to train both clinical staff and department managers on the full revenue cycle process within Epic, and to let them know what issues could disrupt revenue for their areas. Training several department managers and physicians on the Epic Revenue Cycle increases the number of people watching for revenue issues, from a few on the project team to dozens throughout the organization. By preparing staff for the charging issues that can occur in outpatient areas, you can help to ensure your success. Hiring expert help early in your implementation can be beneficial in helping to identify and avoid these potential pain points. Your go-live can then be structured to attain baseline revenue within just a couple of short months, if you know where to look. For a more comprehensive guide on how to protect your revenue, as well as more information on charging issues in EHRs like Epic, make sure to download the whole whitepaper.